It was stamp club night tonight! While everyone was catching up, the ladies enjoyed looking through all of my loot from Convention. New stamping products always get everyone excited! Some people started thinking and planning, and taking pictures of ideas for Christmas projects, since many of my new goodies are from the upcoming Christmas catalogue which will go live August 1st. 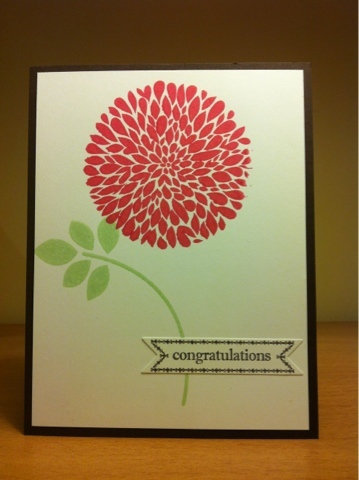 This card uses the Betsy's Blossom stamp set. The blossom is stamped in Strawberry Slush and the stem is stamped in Pistachio Pudding. The sentiment, from Itty Bitty Banners, is stamped in Early Espresso and cut out on the Big Shot using the Bitty Banners Framelits. Sorry this picture is so huge, I don't know how to edit it here, though I did figure out how to make this text smaller! This card uses a 1/4" strip of each of the five new in-colors: Pistachio Pudding, Strawberry Slush, Crisp Cantaloupe, Baked Brown Sugar and Coastal Cabana, all glued onto a piece of Whisper White. Next we punched out a 1 3/4" circle of Whisper White and glued it onto a Basic Gray 2 3/8" Scallop circle and punched an Elegant Butterfly out of the centre. Then we mounted the scallop circle over the stripes ensuring that all of the colours showed through the butterfly window. Finally we inked up our greeting of choice, Itty Bitty Banners again and cut it out with our Bitty Banners Framelits and the Big Shot. Thanks for the great layout, Katie! Awesome make n' takes Diane. Love them both and proud to have one of the Betsy's Blossom cards which I'll be posting on my Card Swap run down on my blog. 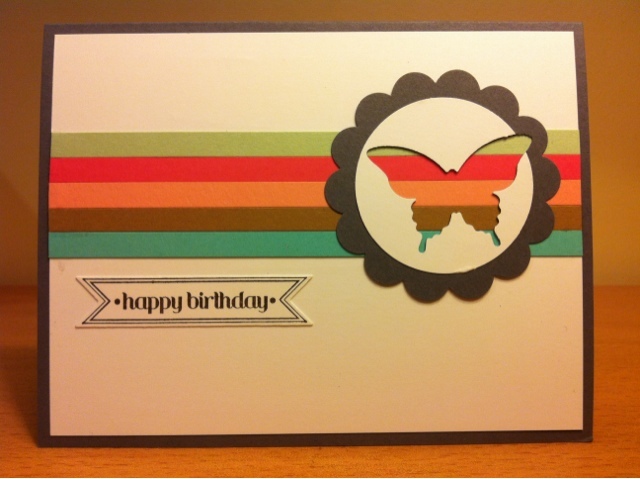 The butterfly card is really neat too! Thanks for giving me the shout out on your opening post and your blog is going to be simply awesome! Thanks Penny! You're such a good friend. I'll be checking you blog to see some of the other great swaps you received at convention.